Login may sometimes fail if your password contains special characters. Try again after changing the password by removing any special characters. 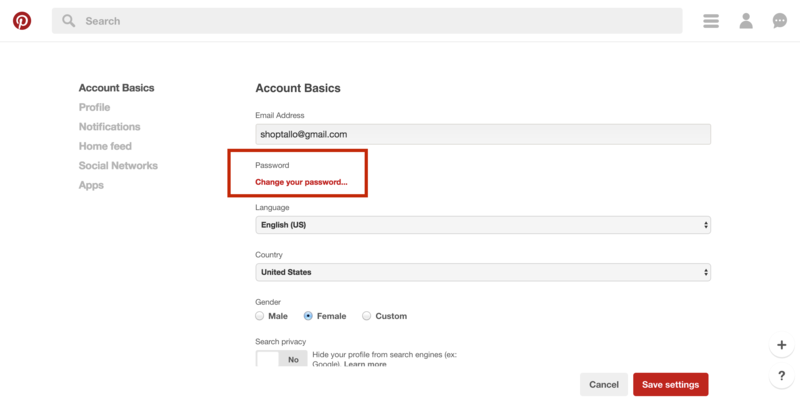 1) Go to Pinterest settings (https://www.pinterest.com/settings/) and click on "Change your password". 2) In the next screen, change your Pinterest password. 3) Done! - Use the new password you just created to "Connect Your Pinterest" account on Viraltag. Pinterest has asked many users to change their passwords due to an issue they are facing. Once the password is changed, the access token for Viraltag expires, and Pinterest has made some restrictions that doesn't let a 3rd party app connect for a second time. This is why you're not able to connect your Pinterest account with Viraltag. 3) Go to your Viraltag dashboard http://app.viraltag.com/accounts and remove any Pinterest accounts you may have an issue with. 4) Click on the 'Connect' button next to the Pinterest icon to reconnect your account. This will let you post to all your Normal boards without any roadblocks. If you still face any issues - don't hesitate to contact us at support@viraltag.com or leave us a message in our in-app chat.